In Ep. 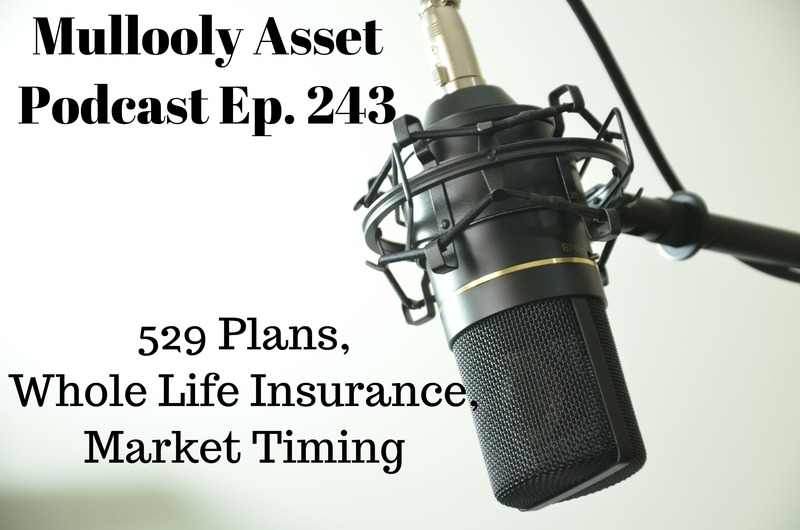 243 of the Mullooly Asset Podcast, Brendan and Tim dive into a handful of articles from this week. They touch on the difference between broker-sold and direct-sold 529 plans and how the latter benefits participants, the reasons against “permanent” life insurance, and the futility of market timing. Tim Mullooly: Welcome back to the Mullooly Asset Management podcast. This is episode number 243, this is Tim Mullooly and Brendan is here with me today. Tim Mullooly: We’ve got a handful of articles that we want to talk with you about, a number of different topics. The first one we want to talk about is an article that we saw on CNBC written by Darla Mercado. The title was This Hidden Factor Could Raise The Cost of Saving For College, and it had to do with 529 plans. Tim Mullooly: Private elementary school I think is in there too, or any kind of private school. Tim Mullooly: Definitely a little more lenient than it has been in previous years where it was pretty much just for college. Brendan: You can use them for a lot of different things. Darla hits on a lot of the basics in her post, but one of the areas that she was focusing on was the difference in some of these plans. Pretty much each state has their own plan, but there are several in some states, and some of them come advisor sold and some of them are direct to consumer products. You should definitely look into the difference. I’m not sure that this is front and center for people when they’re researching it, but this may be the most important attribute that you can identify in a plan that you want to use, whether it’s advisor or broker sold versus direct. Tim Mullooly: You know, one of the points that Darla was trying to make in the post about the advisor sold as opposed to the direct sold plans for 529s, the advisor sold, they come with, depending on the different share classes of mutual funds that you use within the plan, they come with different prices. Brendan: Yeah, costs. Let me back up a second, because I kind of take offense at the idea of these being called advisor sold, because I think, I referred to it as both, but I think that they are very clearly more broker sold, in the sense that I suppose somebody could be dual registered and offer one of these plans, but advisor sold plans like what you are alluding to are coming with sales loads on them in many cases. Brendan: Something that, we would never collect here at our firm because we are fee only, important distinction. I mean, the person at least has to be licensed as a broker, maybe in addition to being an advisor. Like I said, they could be both which is something we’ve talked about extensively on the site but cannot be harped upon enough, you’re allowed to wear both hats in our industry. Tim Mullooly: Right. These advisor sold plans, it’s not something that we as fiduciaries do here, so like you’re saying, maybe more appropriately named broker sold plans. But, the point that she was trying to make were about these sales loads that you’re talking about. If you’re using A shares there’s a bit upfront cost, and then not as much per year after that, or the expense ratios of the funds. But, if you’re using C shares there’s no upfront cost, and now with what we touched on earlier, you can use the money earlier, you don’t have to wait until college. Sometimes for these people using the funds or using these plans, the money’s not in there as long as it has been. Brendan: Darla’s point was A shares charge on, she had some stats in the article, an average commission if you’re using an advisor sold plan that invests in A shares, average commission of 4.4% on the way in. Brendan: Yeah, very steep, and an ongoing cost then for the funds just their expense ratios, the average is about 96 basis points, close to another percent in costs there. Conversely, you could do C shares instead and they don’t have an upfront commission, but their every year expense ratio is 1.63% on average in these plans. Maybe explain why or when somebody would use A versus C, what Darla got into. Tim Mullooly: Right. If you have a longer time horizon, you have a young kid and you’re not going to use the money until college, if you have enough time to leave the money in the account, maybe A shares would be better for you. If you’re going to take the money out in a couple years and use it for private elementary school or if your kid is close to college, maybe the C shares would be better because you don’t have that 4.5% upfront fee, you just have a slightly higher per year expense ratio, but it’s not going to be in there for that many years. Those are the two differences that she was talking about. I think we had a bigger takeaway from the different types of 529 plans. Brendan: Yeah, and Darla briefly touched on this at the end of the post though, just going back to the point that I began with, taking offense at the advisor sold plan, meaning when we work with our clients, since we are fee only advisors here, we cannot accept commissions whether it’s A shares or C shares or any other kind of commission to recommend an investment or any kind of a product or strategy. The direct sold plans, just to kind of contrast them with some of the numbers we’ve shared, have average expenses of 44 basis points. Brendan: No upfront costs on your contributions, less than half of the cheaper version, the A shares, and about 1/4th of the C share cost. Brendan: A way that we handle it in house and a way that a lot of other fee only fiduciary type advisors will work with clients too, is if they are going to fund a 529 account for their children, which is a smart idea and probably something you’re considering, you’re recommending how to use these direct sold plans in the context of building an overall plan for somebody. When you’re building a comprehensive plan and somebody has children they’d like to save money for, you’re going to do some education planning. You can kind of back into some ballpark figures for how much they should be saving, how long they have to invest, and within the plan that you’re going to recommend to them, the 529 plans, you can use any state’s plan regardless of where you live. Tim Mullooly: Right, that’s a good point. Brendan: Yeah, so you’re not pigeon holed. We know the plans here in New Jersey, for instance, are pretty expensive. We don’t really like them. Brendan: But, New York has a great plan. A handful of other states, I know Utah has a very inexpensive plan, too. We can recommend to clients how the money within these plans, no matter which state they use, how to invest in these direct sold plans to hopefully accumulate enough over the years to pay for a nice portion of a college education. You can still work with an advisor and get guidance on a 529 plan if you want it and need it, but you can do it in a way where you’re not being charged a commission based fee directly tied to that account specifically. Somebody could charge you a financial planning fee, a retainer kind of fee, they could charge you an AUM fee but just be managing different accounts for you. There are many ways to get this kind of advice without paying a broker a commission for it. Tim Mullooly: Yeah, and especially because a 529 account is not something that is being actively managed, either. On a lot of these direct sold plans, or all of the plans in general, there’s usually limits as to how many times you can make changes in the account per year, so it’s not like you’re day trading your 529 plan. Tim Mullooly: They usually have age based allocations that adjust over time to shift as your child gets closer to needing the money. In most times, it’s a set it and forget it type thing with the allocation, especially with those that change themselves over time. Brendan: Yeah, and so more importantly, I think you want to be getting advice on how and how much to fund these kind of accounts as opposed to maybe investment expertise because like you said, they’re going to have limited menus, they’re going to have limited transactions, and you’re not really going to add value on that aspect of the 529 plan. Working with an advisor who is doing financial planning for you and can incorporate advice on how to best utilize a direct sold plan I think is ultimately what most consumers should be out there looking for. Brendan: It’s a great episode. Check it out if you missed that one, that was a great chat you had with him. Tim Mullooly: Yeah, well, I’ll link to that in the show notes. Peter is the chief investment officer at Plan Corp. He wrote an article for The Wall Street Journal that was titled The Cast Against Permanent Life Insurance, and it was pretty much talking about the pros and cons or like, myths behind stuff like whole life and universal life and variable life insurance policies and why, in a lot of cases, it’s unnecessary for people. Brendan: Yeah, and Peter made it very clear, exceptions to this exist, but when we’re talking in general here, most people will probably be fine using some form of term insurance because you should be using insurance to insure. I mean, that sounds too stupid to even say, but the way that it is positioned oftentimes is not for that. It’s propositioned as protecting liabilities but also partial investment, even though they’re not allowed to call it that and they won’t, they’ll infer, they, I’m using they as in people who advocate using whole life for everything, because they exist. They think it is the solution for every single problem in the world financially, and it is not. Tim Mullooly: It is a solution. Tim Mullooly: But, it’s not the optimal solution in many cases. Brendan: Yeah, good way to put it. Tim Mullooly: Peter used a lot of overused quotes that you’ll hear from someone trying to, for lack of a better word, pitch you on these different types of insurance. One of the things he said that you’ll hear a lot is, with these permanent life insurance policies, with the growing cash balance, you can be your own bank and take loans from the policy. That kind of touches on what you were just talking about, where it’s not necessarily just a life insurance policy. You can take loans from it and stuff like that. Brendan: Again, in agreement with Peter here, I think you should think about insurance as insurance. You want to protect your liabilities, and when that need is going to end for hopefully a lot of people who are putting together good plans, that need is going to end sometime around your ballpark retirement age. If you can get cheap term coverage that runs out in your mid-60s when hopefully your major liabilities are paid off, nobody’s really depending on you, you have a nice nest egg that you are going to then depend on to not work anymore and live the rest of your days, there’s not going to be a big need for life insurance at that point. When you’re talking about using life insurance as a bank, what that’s referring to is the savings mechanism that exists in a whole life policy or universal or variable that doesn’t exist in the term policy. Tim Mullooly: It’s not cheap, and that’s one of the points that Peter made in the post was that they typically charge pretty high interest rates to take loans from that cash value. Brendan: Right, and in addition to that, if the insurance was meant to insure against a risk and you’re borrowing against the policy and then like, the risk that you were trying to insure against happens, the benefit that goes to your beneficiaries is going to be reduced by whatever you borrowed from it. Yes, the money is there. Yes, it is yours in many cases. It’s just your premium sitting there. You can borrow it, but then you have defeated the purpose, which should have been the primary reason for purchasing the policy in the first place. Tim Mullooly: Yeah, you’re essentially taking a risk on your risk protection policy. It cancels each other out. Brendan: Yeah, and you didn’t specifically need to. That touches on another one of his points in the post, which was that whole life is a good form of forced savings, is the way that he put it. That is true. Brendan: It could force you to save, because you’re going to have to fund the policy or it will lapse. However, you could just care more about your finances and if you know you are not going to save unless you are forced to, there are other ways to force your savings. You can automate contributions into something like a savings account that is separate from your regular checking account at the bank. Put it in someplace that’s not as easy to get to. You can automate contributions into your 401(k) at work or an IRA account or your children’s 529 plans. You can make forced savings in ways that don’t involve buying a whole life policy. Tim Mullooly: Right. You can force yourself to save money with much less strings attached to it. Brendan: You’ll accumulate the forced savings. Instead of buying a whole life policy, if you bought a term life policy, and then even people will talk about investing the difference, which is certainly an option and probably one that will yield higher returns over time, but even if you wanted to be ultra-conservative, you could split the difference and send it into a bank account, maybe use an online bank account now that’s paying something like 2%, and at least the money is super liquid. Where, if you go like we were just referring to, if you go to borrow from the policy in the future, it’s there. It’s liquid to a degree. Like, let’s think of how accessible money is on a spectrum. It’s more accessible than an IRA, probably, or a retirement account. You’re not going to be penalized for borrowing from your insurance policy, but it’s not the same as if it’s just sitting in a bank account ready to go. Tim Mullooly: Right. You don’t have to worry about a high interest rate or things like that when you’re taking money just out of your savings account. There really isn’t anything attached like that. Brendan: You can force yourself to do savings in different ways that don’t involve this. Another kind of myth that … Some of these aren’t myths, but it’s just like, you don’t need to do what the person is suggesting. Tim Mullooly: It’s like, there are better ways. Yes, what they’re saying is true and it will accomplish what it’s meant to, but there are easier ways to do that. Brendan: The very first one was talking about how you should buy whole life insurance because it’s cheap when you’re young. You should buy it young because you will get a good cost. That is absolutely true. It’s going to be cheapest when you’re young because the odds of you needing the coverage are the smallest the younger you are, I mean, given any other health issues. Tim Mullooly: Right. Think about, why? Why is it the cheapest? It’s most likely because you have little responsibilities or not many dependents or people needing your income, stuff like that. That’s why it’s cheap, but that’s also a reason why, if you’re a single person with no dependents and you don’t own a home, you don’t even need life insurance at that time. Brendan: If anything, at that point in your career the more important coverage to discuss would be disability insurance, because the odds of you becoming unable to work at some point during your working career from, let’s say age 25 through 65, the odds of needing that are much higher than the odds of in the early years of a whole life policy needing life insurance coverage, especially when as you alluded to, you do not have dependents, a home, you’re not married, there may not be a need for it at all. Just to suggest that you should get in while you’re young just because you’re young, I’m not sure. Maybe if you’re taking care of a lot of other things first and maybe you have some big life events on the horizon, like you are getting married or things like that, sure, but I think I would probably recommend taking care of some other things first before just assuming that because you’re young and you’re going to get a cheap rate you should lock in something like a whole life policy. Definitely not the first thing that you should be doing in terms of financial decisions. Tim Mullooly: No, especially when you’re young there are usually a handful of things on your priority list in terms of getting your finances in order that you should probably take care of first. The last article that we wanted to talk about today was written by Drew Dickson from Albert Bridge Capital. It was titled The Futility of Market Timing. Brendan: This was one of my favorite posts that I’ve seen in months now. Brendan: This was so awesome, I love this post from Drew. Brendan: Yeah, you should visit the blog. Tim Mullooly: Because there are really good charts that give you a really good visualization of what the article was about. I mean, the title is pretty self-explanatory. Drew talks about, he gives a pretty clear example of why market timing is not that important. Brendan: I’ll walk through the hypotheticals here. Tim Mullooly: It’s kind of the same thing as what we were just talking about. It’s like, yes, technically, as he lays out, if you were to time the market correctly, perfectly, you could make more money, but it’s just an unnecessary thing to worry about, I guess is kind of the theme of what we’ve been talking about here. Brendan: Right. The example that Drew lays out is, assume you are 25 years old and you’re going to invest $1,000 a year into the S&P 500 for 30 years. He went back in a number of different 30 year periods, but the first one that he did was from 1989 through the present, assuming that you did this. He walked through two examples. Number one is the perfect market timer, where you invest your $1,000 every year at the exact lowest price of that calendar year. Tim Mullooly: Nail it on the head, every year. Brendan: Do this for 30 years, every single year, which literally nobody on the face of the earth can do, but everybody wants to try because it seems like it would add a ton to your returns to have this kind of perfect foresight. Tim Mullooly: Right, you’d think naturally. Brendan: Okay, and so he juxtaposed that against the worst market timer ever, who does the exact same thing except buys at the exact high every single year. Worst price you could get possibly every single calendar year for 30 years. The perfect market timer ends up after 30 years with $155,769. Tim Mullooly: Right, pretty good. Awesome, yeah. Brendan: Very good. The worst market timer in the world gets $121,822. Tim Mullooly: Still, pretty good. Brendan: Like, pretty good. You would imagine that the discrepancy between those returns would be far greater. If you told me without showing me the worst that the best was $155,000, I would assume that the worst was going to be like, 50 grand or something like that. Tim Mullooly: 50, yeah, right. Brendan: Not really the case. Point being that, even if you could do this, any of us could do this, even if we could do it, it doesn’t add that much value to the investment. The thing is more to have a consistent plan, continue buying over this 30 year period or whatever your horizon is, and just forget about having perfect timing skills because it’s not going to be that important over the long term. Tim Mullooly: Right, and I think another point that, well, that I took away from it was more, he used 30 year time stretches for this and he showed different ones as well. He did 1959 through 1989, 1969 through ’99, and they all came out with the same minuscule difference between best and worst. Brendan: You could have the worst luck or timing in the world, like in this example, and you’re still getting 80% of the way there. You have 80% of what the hypothetical dude with Biff’s sports almanac has by nailing the exact low in the market every year, this omnipotent person who doesn’t exist. You can get 80% of the way there even if you are the most unlucky person on the face of the earth. Brendan: There could be a big difference, sure. Tim Mullooly: Then it might matter. Tim Mullooly: Yeah, that’s such a big gamble. Brendan: It’s not a decision I would repeat 100 times over. You’re probably not going to nail it 99 times out of 100 in the timing department. Tim Mullooly: Absolutely. It’s definitely a really good article from Drew there and there are some, like we said, good visuals with the charts as well, so definitely go check out the full article in the show notes. That’s all we had for episode 243. Thanks for tuning in, and we’ll catch you on the next one. Ep. 231: Back Into the Market, Tax Loss Selling, & What is Smart Beta?